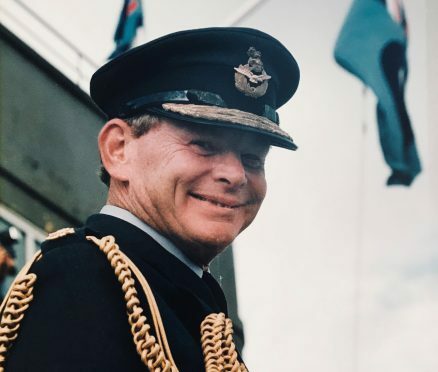 Former RAF Leuchars Station Commander Air Commodore Jack Haines OBE RAF has passed away peacefully aged 72 after bravely fighting Alzheimer’s disease for 13 years. Air Commodore Haines enjoyed a wide and varied career, during which he served as a navigator on four different aircraft types – including flying from carriers with the Royal Navy, an exchange tour with the US Marine Corps and also served at NATO Headquarters in Brussels during their involvement in Bosnia. However, it was in North East Fife where Air Commodore Haines and his wife Lesley felt most at home. He began and ended his 38 year career at RAF Leuchars with his final command post as Station Commander and the Air Officer of Scotland and Northern Ireland. He and Lesley settled in St Andrews when he retired from this post in 2001. They continued to play an active role in the community and Air Commodore Haines was appointed a Deputy Lord Lieutenant in 2003. He was a keen and able golfer and a member of The Royal and Ancient Golf Club. Air Commodore Haines was diagnosed with early onset Alzheimer’s in 2004. He enjoyed all sports and when his illness prevented him from actively participating he was an avid spectator. During his illness, he took part in ground breaking clinical trials for Alzhiemers and supported the Dementia Friendly St Andrews campaign as he wanted a cure and better understanding of the disease. In a final wish, he donated his body to St Andrews University. Air Commodore Haines is survived by his wife Lesley, their daughters Sally Ann and Vanessa and granddaughters Millie, Lottie, Maisie (Madras College) and Anna May (Greyfriars RC Primary School). Air Commodore Haines’s wife Lesley said:“I have been overwhelmed by the outpouring of love and respect shown to my husband. “His great ability to communicate with everybody made him a man who touched everyone’s heart. A Service of Thanksgiving will take place in January.